24/12/11 - Acquisition - Cambrai, Musée des Beaux-Arts - Jean Ducamps, a student of Abraham Janssens, born in Cambrai and active in Rome, is still generally overlooked by art historians. Not so long ago, the best known of the works attributed to him, in several known versions, was Death Comes to the Table, today acknowledged to be by the Florentine painter, Giovanni Martelli. A few years earlier, Gianni Papi suggested identifying Jean Ducamps with the Master of the Incredulity of Saint Thomas, an anonymous painter for whom several works have been associated with the canvas held at the Palazzo Valentini in Rome . Jean Ducamps (or in Italian, Giovanni del Campo) is known notably through a biography provided by Joachim von Sandrardt in his Teutsche Akademie. In it he describes a Liberation of Saint Peter which formed part of the ensemble of the Master of the Incredulity of Saint Thomas and was recently lent to the Whitfield Gallery in London, under the name of Ducamps, for its exhibition Caravaggio’s Friends and Foes. There, it was mentioned in connection, rightly so apparently, to a Saint Jerome belonging to Clovis Whitfield (ill.), resulting in the attribution of this last canvas to the same artist. 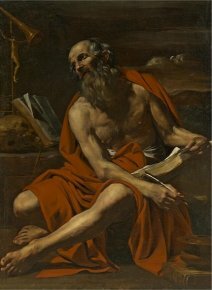 This very beautiful Saint Jerome has just joined the Musée des Beaux-Arts in Cambrai. Whether it really is by Jean Ducamps (a native of this city) or not, the purchase of a Caravaggesque painting of this quality by a French museum is entirely justified and should be highly commended. This transaction, for a total of 200,000 € with the help of FRAM Nord-Pas-de-Calais region and a substantial contribution from the Cambrai City Hall, is particularly important as this museum had not made any substantital acquisitions for almost ten years. The work will fit into the collections quite naturally, providing a transition between Flemish Caravaggesque painting (there is notably a Card Players by Théodor Rombouts and 17th century French art (represented until now with works only from the end of the century). Jean Ducamps, a little bit like his contemporary Nicolas Régnier, also a student of Janssens, a native from the nearby Maubeuge, and who also worked in Italy as a Caravaggisti, is in fact at the crossroads between French, Flemish and Italian cultures . On Ducamps, see also, recently : Francesca Cappelletti "Giusto Fiammingo e Giovanni del Campo", in I Caravaggeschi, percorsi e protagonisti, t. II, Skira, Milan, 2010, pp. 435-439. We would like to thank Mael Bellec (recently appointed curator at the Musée des Beaux-Arts in Cambrai) and Arnauld Brejon de Lavergnée (responsible for this purchase) for their help in writing this article.